Carol King speaks to John Peter Sloan about how he came to write the fastest selling English-language course in Italy and how he makes learning a language fun using humour, role play and theatre. How did you come to live in Italy? I left Birmingham [England] when I was about 16 and went busking in Spain. I then became a rock singer in a band [The Max] for 17 years. We toured France and then came to Italy. I knew within the first five minutes of being here that I wanted to stay. I completely fell in love with Italy. When did you start teaching English and why? About 10 years ago in multinational companies in Milan. I have a daughter and I wanted to be able to stay in one place and see her. What inspired you to do your cabaret show Culture Shock (2007) and why do it in English? It was born out of English lessons. My lessons are animated and classes were always full. Word got around and I started to write comedy plays in English. The shows’ audiences are two-thirds Italian, the rest are British or American. Teaching a language can be like being a performer. It’s been said you ‘revolutionised’ how to learn English by making it enjoyable, do you think your experience as an actor and singer has helped you with that? Absolutely. When I busked I had to communicate with people and involve them in order to build a crowd. I learned a lot of communication skills on the street and took them into the classroom. Italians have a psychological block about learning English and you need to make it fun. Newspapers have called me a ‘revolutionary’ and a ‘genius’, but I was just being myself and making learning better. 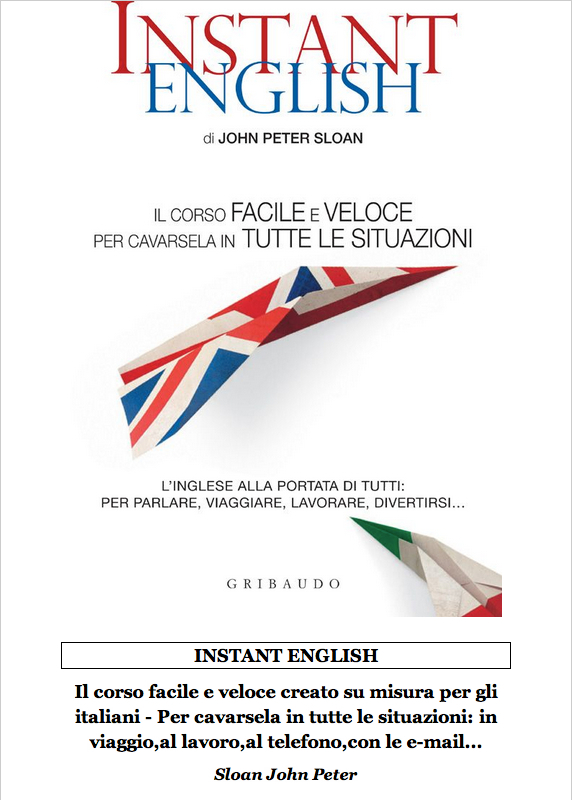 My first book, Instant English, came out in 2010 and it is the first [learning English] book written just for Italians addressing their specific problems, which is key. What’s the biggest difficulty Italians have in learning English? Generally Italians think [learning] English is very important. What’s more important is their fear of making mistakes and looking bad – the ‘brutta figura’. Linguistically certain things are taught in the wrong way and teaching is appalling here [in Italy]. I dedicated Instant English to all Italians who think they are the problem when it comes to learning English when it’s the way it’s taught. I use Italian in teaching to explain the rules and the practice is in English. You need to engage people, not bombard with a list of verbs. We don’t know the problems Italians have until they are taught well. If you have fun then you learn more and learn better. I have a school in Milan and the teachers are selected as much on their personality as their qualifications. We use theatre, games and shows when teaching. Does your language school have any famous Italian students? Yes, we have a few actors and comics, including radio and TV presenter Marco Balestri, actor Francesco Villa, and the Calabrian comics [Andrea] Bove and [Enzo] Limardi. We always have a few comics on site that we give free lessons to as it keeps things ‘allegro’. Are more Italians learning English now because of the economic crisis? Yes, they are. I sell more books during a crisis because they want to leave [Italy]. I’m a big fan of southern Italy – Apulia, Calabria – and when I’m there I talk to schoolkids. As beautiful as it is down south, there are limited opportunities, and I emphasise the massive importance of English: kids need one day a week [of teaching]. In Italy children start [learning English] too late; in Germany and Holland they start as toddlers. But Italians are maestros of excuses and say that Germans are better [at English] because German is similar to English. Now they say Chinese is going to be the lingua franca, which is not realistic. The reality is that the Chinese are learning English because it’s something important for work as business is conducted in English, so they will concentrate and study. Italians are waking up slowly. The people at the top are not really interested and don’t care that much. In TV they’re more interested in selling saucepans than education. TV has a responsibility to teach and Italian TV doesn’t do that – and they say, “Where’sthe money?”. All Italian kids should have the right to learn, and want to. You speak Italian very well, how did you learn? I learned it the same way I teach it. I don’t care if I make mistakes and I think if Italians have that approach they learn. Anyone is halfway there if they treat it as a game - a puzzle - and learn the pieces. Language learning is fun, and if you see it as fun, you get on. I wrote down five or six words a day and tried to use them. I still make mistakes, as I did 15 years ago, but I’m not worried about being perfect. What’s the biggest difficulty English speakers face when learning Italian? and aren’t aware of the musicality in Italian. I’m not a tourist: I like Italy because of Italians. Italian men are more emotionally free than English guys. They kiss and hold each other, and are very comfortable – it’s not a threat to their masculinity. That makes me realise how repressed English men are. Italian women look after you; they are extremely ‘coccolo’. They buy you a shirt and make sure you look OK before you go out - they’re very affectionate and passionate. What do you like least about Italy? Sexism: Italy’s still very sexist in its ridiculous portrayal of women as mindless dolls on TV besides slobbering dinosaur men. I don’t like it as it sends the wrong messages to boys. Italians are also incredibly individualistic, there’s no sense of unity and they are paying the price [for that] now. They are learning that if the country is suffering, they do too and if they unite, even for selfish reasons, they wouldn’t be in such a mess. Italy is unbelievably cliquey in any field. In services it’s not what you do, it’s who you know, and if you knock on a door it’s: “Who sent you?” I’ve got in through the back door as I’m English and different…. I was happy to write a book and enjoyed it. I didn’t expect the madness that ensued when it became the fastest selling [English] course ever in Italy.